APRIL 2013 What do you do if you don’t want to wait until next year’s PWR! Retreat ? 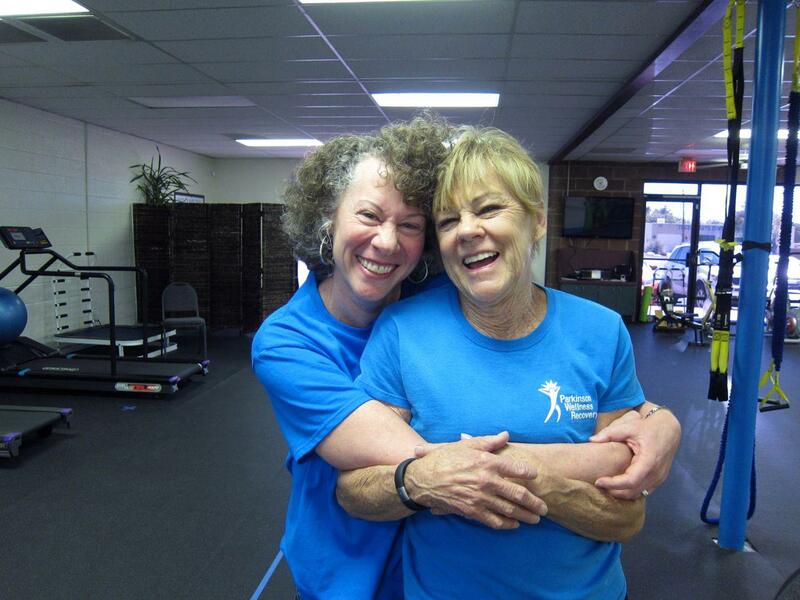 Book yourself in for a one-on-one at Parkinson Wellness Recovery gym in Tucson. Here are the notes of Darcy Blake who took the 5-day plunge. DAY ONE After Dr. Krystal Greene analyzed my walk, I learned about forced end range (stretching more instead of just enough), practiced the Basic Four exercises to do daily, worked with treadmill, roller discs and hand-pullies, got a treat on a full body vibrating machine before a complete walking workout with sticks and a metronome. Will try out a new brand of sticks each day to decide what brand is best for me. Turns out we burn 30% more each day when we add the arms into the walk. Concentrating on how to walk right, why I need to do toe raisers and how to throw away extra tension in those fingers. DAY TWO The morning was high intensity interval training and Dr. Greene worked out a treadmill regime that I can do on my lunch hour. The beauty of this type of exercise repetition where you give it your all for a little bit and then rest for a bit, is that you get your fitness training accomplished in less time than doing activity at a ho-hum pace. Following that, I tried to mimic a baseball player with a medicine ball and net, I gave several brands of sticks a comparison test drive and chose the ones that work for me. Then we played with balance steps, and a bosu globe. Dr. Greene is another of those brainy docs with years of education behind her. She has a double doctorate in nutrition and exercise. She says that the worst enemy of a PD person’s diet is those simple carbs. DAY FOUR We focused on agility specific exercises. Dr. Greene says accelerating, decelerating, and change of direction are important for everyone, but even more important for us with PD. Being able to move through space with fluidity is critical. So I learned direction and velocity exercises that involved timing and distance judgement. A nutrition talk capped off the day. And guess who walked in? Athlete Tim Bowden, the PD extraordinaire who has been featured in the Arizona Star. 140 lbs. of solid muscle. He was preparing for a big race. DAY FIVE I joined a high intensity workout with a group of PD athletes. The camaraderie of this group strengthening their bodies and building their agility was a special moment not to forget. But all too soon, it was time to fly home. On the flight, I thought of a quote by Mahatma Ghandi that is posted in front of the treadmill at the Gym. ‘Strength does not come from physical capacity. It comes from an indomitable will.’ The quote reminds me of Sally Michaels (left) and Dr. Krystal Greene (right) who have confidence and expertise that there is an exercise plan that will make a difference in how you feel. Thanks to them, you WILL start believing in your plan and you’ll start doing it too! Wow Darcy, what an incredible recount of your experience with us. I feel so honored to have worked with you and brought you to new expectations and possibilities. FYI, my last day at the PWR Gym is the end of June. After that I am free to come to SF or wherever needed. Please share this with as many as you can, as I feel the need to fill the need! All the best to you, and keep on reaching for greater heights. They are there for you to grab and enjoy. You are a healing miracle and the world should know about you so that people can reap what you have to offer!